Nepali style fresh radish pickles! An easy recipe and a step by step guide with pictures. Marinate radish with 1 tbsp of salt for 10 minutes. Meanwhile toast mustard and sesame seeds together only until they start popping. Turn off the heat and keep stirring until golden brown. Start this whole process by cold pan with the seeds in it. 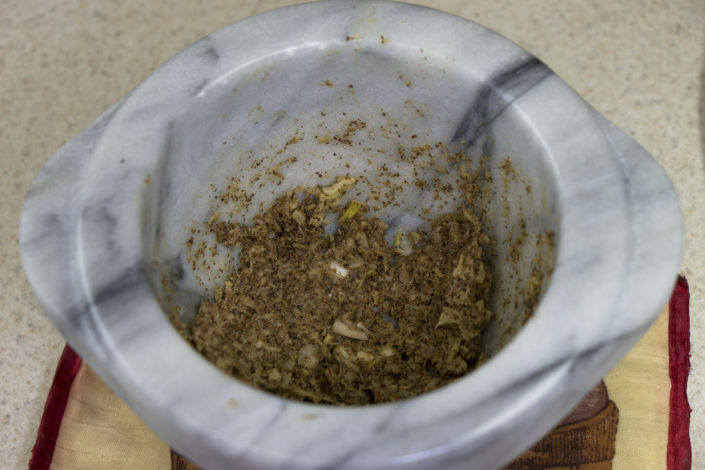 Grind the seeds until medium ground in the mortar with pestle. Add roughly chopped ginger and garlic and keep grinding until paste. When the radishes are marinated for 10 minutes, squeeze and discard the juice. Pour turmeric, remaining salt and lemon juice over the radishes. Fry fenugreek seeds and chili until golden brown and pour it over the turmeric. This process is called tempering. This pickle can be stored in the refrigerator for at least 2 days. This form of pickle is from among many other styles like sun-dried radish pickle, radish pickle with field peas [sano kerau] etc. This could be served as appetizers, snacks or with basic meal like daal bhat [Nepalese staple meal].Working with mortar and pestle needs little practice but not impossible. This is a must tool in every Nepalese kitchen. Food becomes much tastier and consistency is different on Mortar in comparison to blenders and grinders. Green chili can be substituted with dry or powder chili. 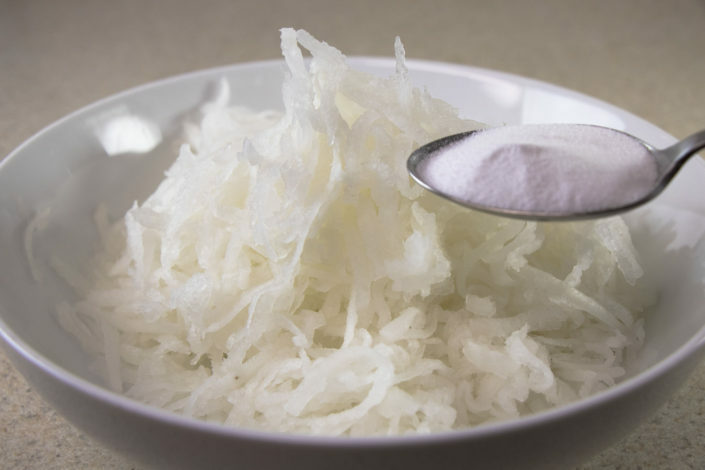 Lemon juice can be substituted with Lapsi [Nepalese hog plum] in fresh or powdered form. 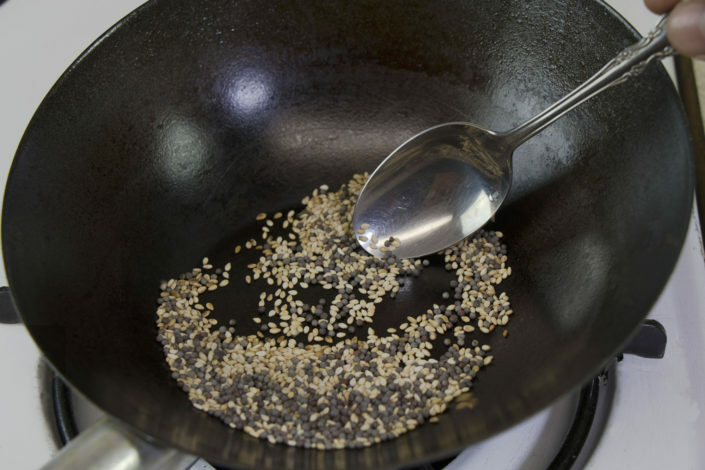 Mustard seeds can be substituted with mustard oil. 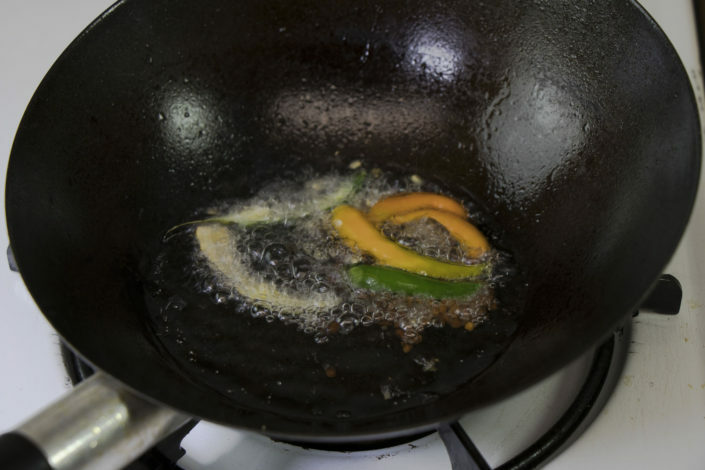 Just use mustard oil for frying instead of vegetable oil. A common dish of Nepal, cooked in a simpler way. A must try recipe. Heat up a cooking pot, add oil. Add ginger and garlic paste, cook for 1 minute while stirring. Add tomatoes, cumin, and turmeric powder. Cook for another 2 minutes while stirring. Add cauliflower and potatoes, followed by salt and chili. Stir and cook for 2 minutes in high flame. Then cover the pot with a lid. In a low possible heat settings, cook the vegetables until soft while stirring occasionally. It may take 12-15 minutes to get cooked. Poke the vegetables with a spoon to check the doneness. Add the green peas and cook for 1 minute. Fresh ginger and garlic are peeled, and grinded in a mortar with pestle until paste. Alternately, a blender can be used. Just blend until puree with a tiny amount of water. Water helps to blend faster. Alu kauli tarkari is one of the common vegetable dish of Nepal. Basically, potatoes and cauliflowers are cooked together with common spices like ginger, garlic, onion, turmeric, cumin etc. It tastes even better with fresh green peas. To cook this dish, find the freshest vegetable and spices from the market. Sometimes we leave our old dry spices more many months while they get flavorless over the time period. So it is always good to have fresh ground spices. 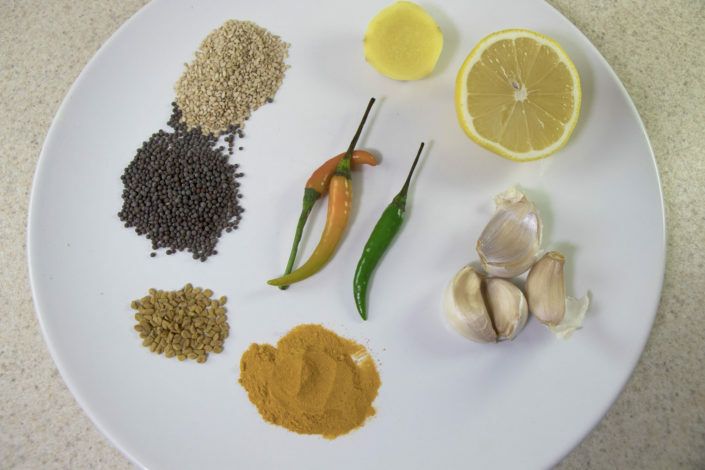 We can even grind our whole spices in mortar and pestle or a spice grinder prior to cooking. Never put water if it is gets dry and or about to burn. Just turn down the heat as lowest as possible. Cover the lid and wait patiently until cooked. Frequent stirring is necessary, but we are only folding, not stirring like a whipping action. This will break the break vegetables into pieces and loose the texture. Small sized cilantro leaves or micro cilantro helps to enhance the look and taste. Micro cilantro is very high in nutrition. An easy way to cook pulau in a rice cooker. Just follow this recipe to make it in big batches. Rinse the rice and soak into 2 cups of water for 20-30 minutes. After soaked, strain the rice but keep the water for cooking. Do not throw them away. Smash the cardamon until it cracks. Gently fry the carrots and peas into 1 cup of ghee for about a minute. Pour the reserved water into rice cooker. Add rice, vegetables, cloves, cardamon, salt and sugar. Then turn on the electric cooker. While the rice is cooking, fry the mixed nuts with the rest of the ghee until golden brown. After the rice is cooked, pour the fried nuts and fold it gently. 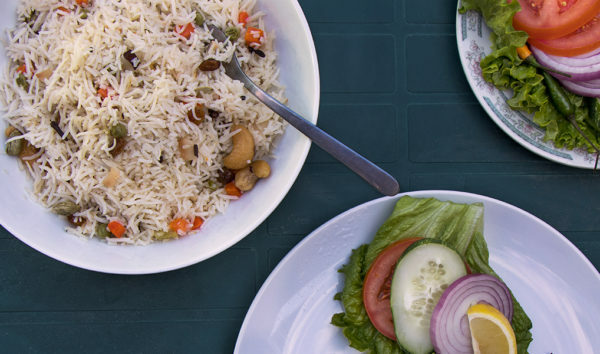 Pulau is a well known dish in Nepal, especially served as a substitute for rice in parties. Best quality rice always makes the best pulau. It has rice taste and quite heavy.Rice cooker is not necessary. It can be cooked in any pot. The purpose of using the water from strained rice is to keep the starch and also to accurately measure the recipe. If we decide not to use that water, simply add 1 1/2 cup of cold water into strained rice. Do not over fry the the nuts. They turn bitter when over fried. Ghee can be substituted with clarified butter. 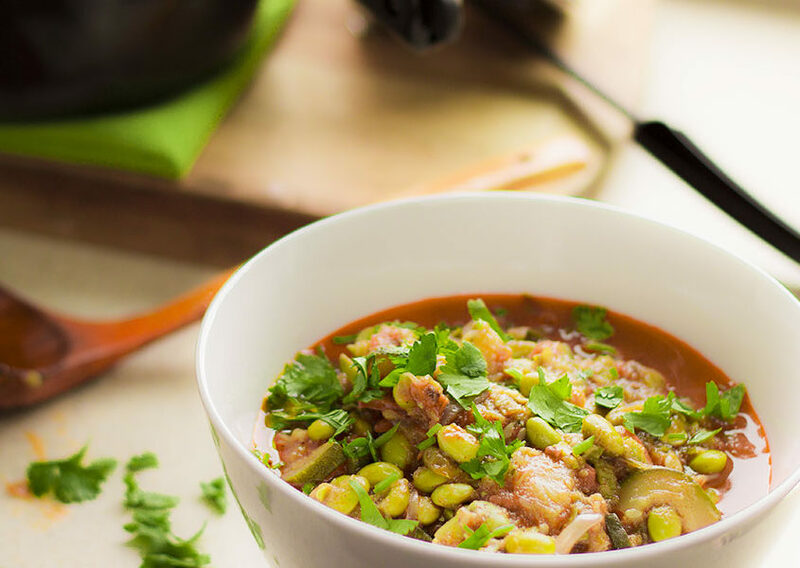 A traditional Nepalese dish prepared with fresh green pumpkins and edamame have an acquired taste. Its authentic, yet simple. A must try recipe! - Heat up oil in a pressure cooker, fry coriander seeds and fenugreek seeds until golden brown. - Add onions, cook until translucent. - Add ginger and garlic, cook until golden brown. - Add tomatoes, cook for 2 minutes. - Add pumpkin, soybeans and the rest of the seasonings except cilantro. Cook for 2 minutes. - Cover the pressure cooker with lid and cook for around 15 minutes on a medium heat. - Garnish with fresh cilantro leaves while serving. Pressure cooker isn’t very necessary. Other options can be in any type of cookware like a pot, wok or a deep pan etc. Paprika powder can be substituted with a very mild chili powder. Although, it makes the dish a bit spicy. This dish may substitute meat as it contains higher nutrition. Also goes very well with bread, rice or roti. Nepali Savory donuts cooked in a simple way. A must try recipe! 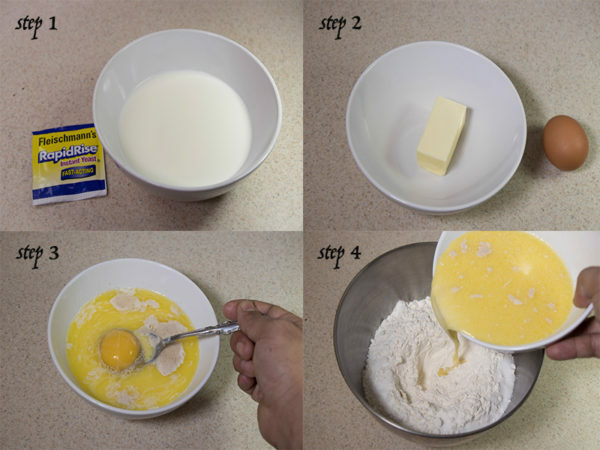 Mix yeast and warm milk [not boiled] in a bowl by using a spoon or whisk. Leave it until bubbles form or the yeast rises. This may take up to 10 minutes. Add eggs and butter and mix with spoon. Mix all the dry ingredients in a separate bowl or a working surface. Then mix the yeast mixture, knead gently to form a dough. Shape it into a ball shape and cover with plastic wrap or a wet towel for about 45 minutes. Leave the dough untouched in a warm area until it doubles in size. 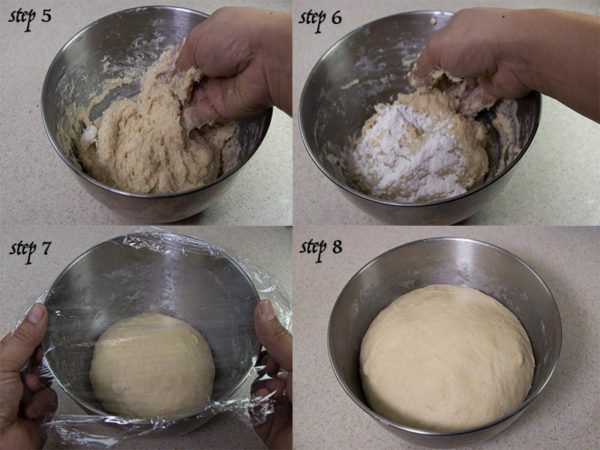 This process is important as the yeast works with dough as the dough rises. Please note that this process may take less or more time as expected according the the room temperature. Warm surface and room helps to rise the dough faster. 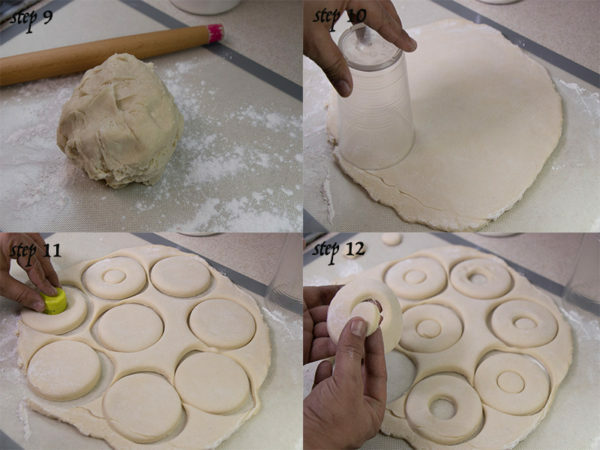 On a flat surface, sprinkle some flour and roll out the dough about ½ inch thick.By using a donut cutter or any round glass and bottle cap, cut the dough into donut shapes. 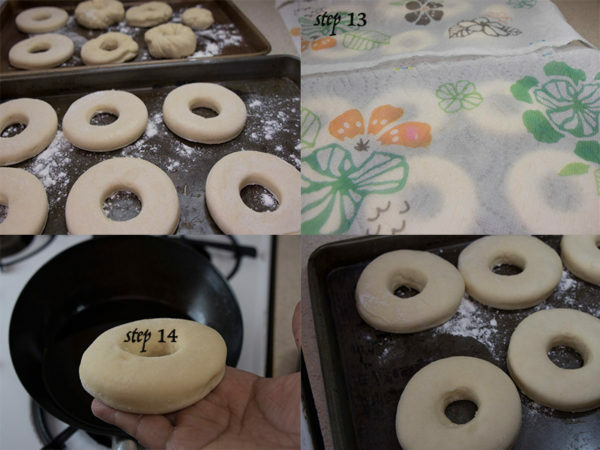 Place those donut doughs on a flour dusted surface and cover them with a moist towel for around 15 minutes until it doubles in size. - Heat up the oil to a medium temperature. Test the oil by frying a small piece of dough, if it floats slowly, it is ready to fry. Ideal temperature for frying oil is between 350°f and 360°f. 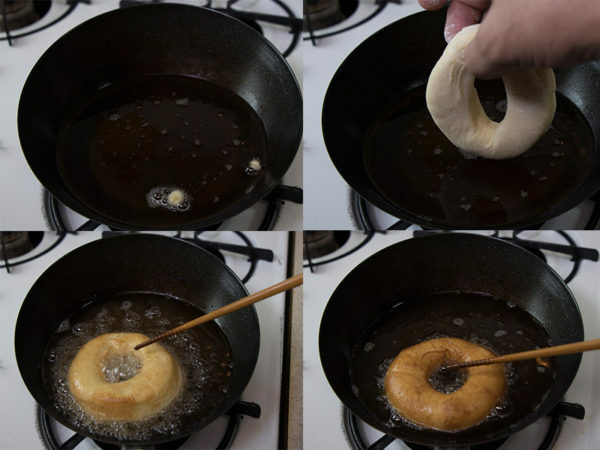 Gently fry the donuts 1 to 2 pieces at a time. Turn over when one side becomes brown. This may take less than a minute. Do not over fry, as this will make the donuts bitter. Place the warm donuts on a paper towel. Serve it warm for better taste. 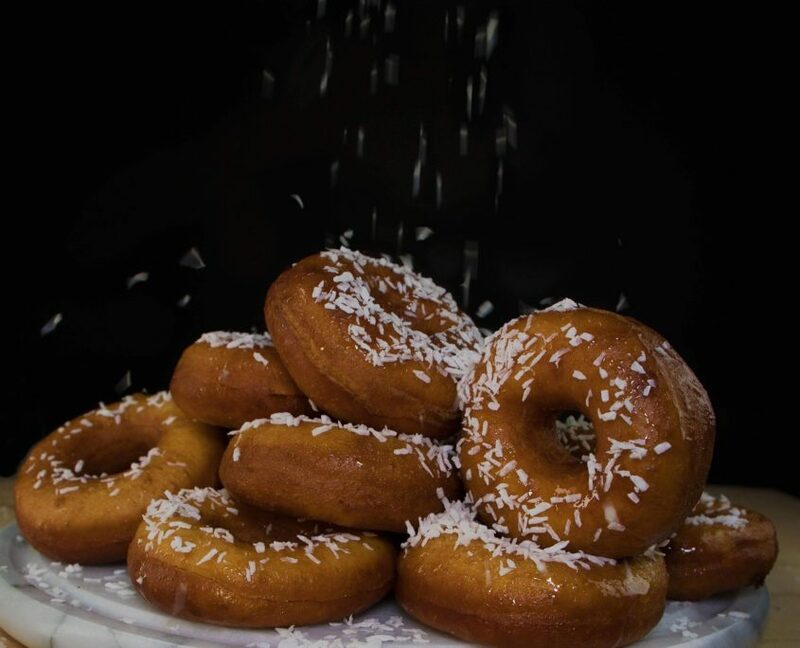 Donuts can be glazed with melted honey and coconut flakes as shown in the picture. - Nepalese style donuts or doughnuts are served best with warm tea. Plain, sugar coated, and coconut glazed donuts are the most popular types of donuts in Nepal. - Doughnuts tastes better when served warm. - They can be stored for 1 to 2 days in a room temperature. To store it wrap them in a napkin and store in a paper bag. If they become stale, we can microwave for 15 seconds to have it warm. 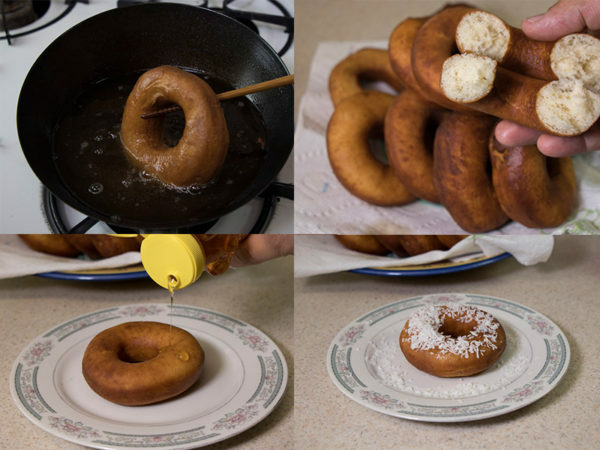 - Doughnuts can be glazed with honey, maple syrup, agave nectar, chocolate, powder sugar, coconut flakes and many more etc. 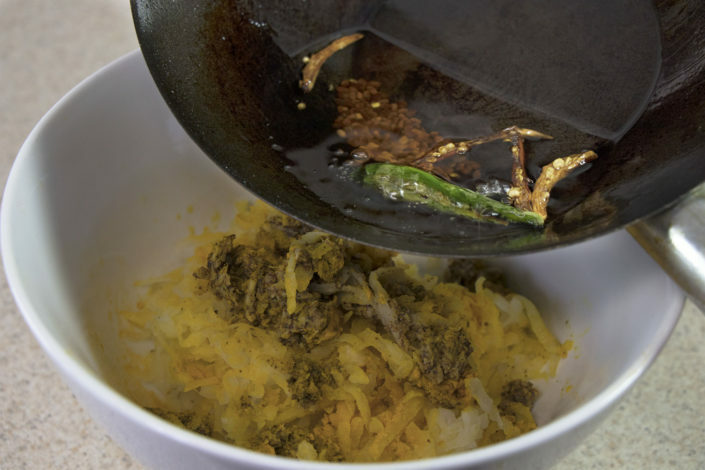 – Mix all the ingredients except butter or ghee until fine puree or batter consistency. 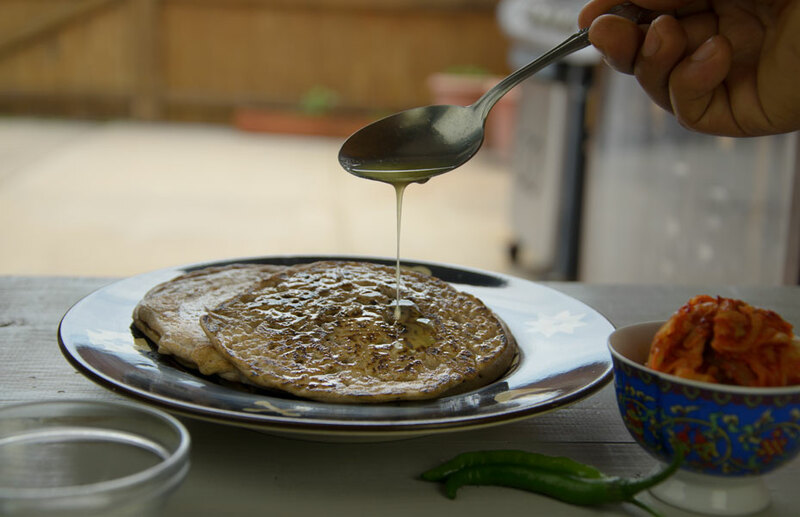 – In a medium hot pan, add just a little bit of ghee and spread it all around the pan. – Add a ladle full of mix and spread while shaping into a flat and round shape like tortilla or roti. – Cook in slow flame turning both sides until very crispy and brown. Cover them with lid if the roti is too thick and need more cooking. – Above is a very basic phaparko roti recipe. For more richness we can add minced ginger and hing [asafetida], which is also another traditional way. We can always play around with rest of of the ingredients and spices. Just keep in mind, keep the flour and water ratio in equal measurements. Cooking roti takes times to master but anyone can make in the beginning, just do not overheat the pan. Cast iron pans or other thick metal pans are the keys to make better rotis. Another important note is to keep less spread on the pan which helps to cook faster and crispier. Do not burn the roti, as it may taste bitter. Gedagudi [beans] means generalizing all kinds of beans from fresh to dry. But if they are dry, it is called Sukeko Gedagudi. 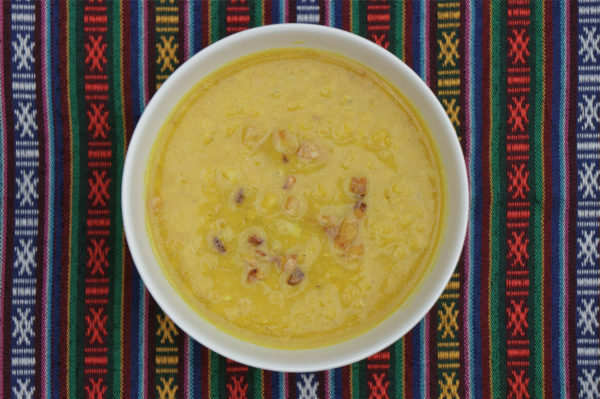 Once a year on Janai purnima [a day when the famous Dashain festival is welcomed], sprouted beans are typically cooked as hot soup with meat or vegetables. Those kinds of soups are often cooked in cold winter days. Also they are sold in few recreational centers like gym, pools and other sport facilities. Nepal is rich in grains and beans, a variety of them are grown in different seasons. 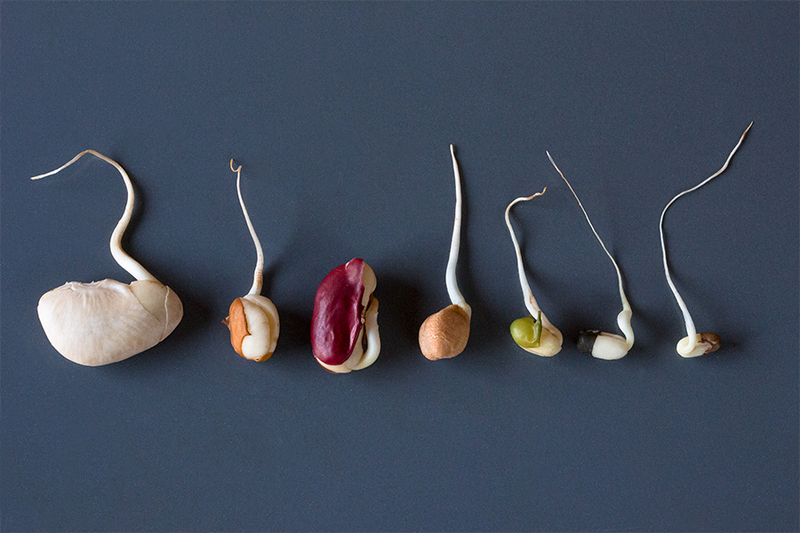 Sprouting can increase your ability to absorb nutrients in the beans that would normally be less digestible because they are bound by phytic acid. Bean sprouts can be eaten raw, though Vegetarian experts warns that raw sprouts may carry potentially harmful bacteria. Purchasing beans from a reputable source helps us to find better beans. We must always wash them thoroughly and cook them before using to decrease risk of food-borne illness. The recipe below shows us a very simple way to sprout any kinds of dried beans. Just keep in mind, boil the sprouted beans until tender and cool them off to use them in salads. This will prevent improper digestion. Rinse the dried beans with water. Soak them overnight with almost double the amount of water. Next day drain the water and put them in a perforated container or any container with holes. Cover them with a black cloth or towel. In next 12 hours or so, sprinkle water just enough to make the beans moist and cover them back. Repeat the same process at least two times a day for 3 days. Beans will start to sprout fully from the fourth day. While choosing the beans, make sure the beans are from the trusted company who sells good quality beans. Very old and bad beans won’t sprout fully and often go rancid. So choosing the highest quality beans are the first priority. Try to rinse and soak the beans in distilled water so that they sprout in a healthy moisture. We don’t particularly need black towel or cloth. Any cloth or material which blocks the light to pass through the beans are just required. We can even sprout the beans in a dark room where there is enough air circulated. Sprouts with start to turn green and grow micro greens if accidentally exposed to light for a longer period of time. Add tomatoes and continue crushing until the desired puree consistency. 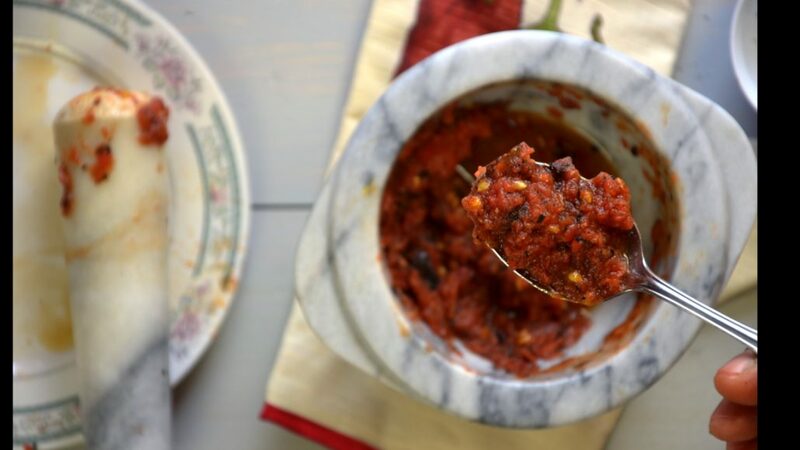 Above recipe is one of the quick and popular chutney recipe in Nepali everyday kitchen. Szechuan pepper gives a slight peppery and pungent aroma while roasted tomatoes and chilies combines to give an extra kick. Of course! It is a mouth watering achar. Achar, refers to all kinds of jarred pickles or fresh chutneys. To master this recipe, choose the ripe but hard tomatoes so that in can be grilled nicely. They can be roasted in oven, pan, direct fire or whatever possible. Do not burn the chili, just toast them. 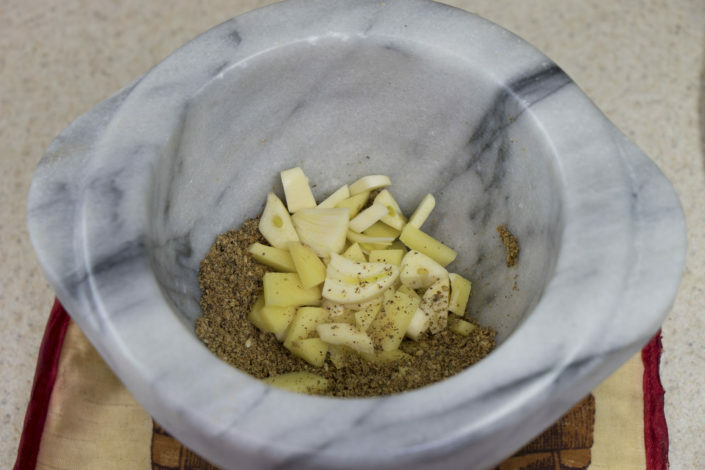 Using mortar and pestle can be little tricky in the beginning, but it is just a matter of little practice, which is easy.